Simultaneously reading a recent Guardian article on the issue of open-access scientific publication, and Robert K. Merton’s “The Sociology of Science: An Episodic Memoir” (in The Sociology of Science in Europe, 1977, pp. 3-141) spurred me to wonder whether science studies could aid scientists to transition to a new model of scientific publication that is up-to-date with technology, but that also retains the intellectual and institutional virtues of present models. My answer to this question is: probably not. The thought occurred to me because of Merton’s consideration of whether or not his 1940s-era understanding of how and why scientific credit is assigned the way it is could have led to the establishment of something like the Science Citation Index (SCI) prior to its actual appearance in 1963. Merton speculated on why it didn’t, but he also marked a growing contact in the 1960s and ’70s between the historians and sociologists of science, publication indexing, and the rising tide of “science indicators”. He reckoned this contact would grow as both the sociology of science and science metrics matured. Unfortunately, the 1970s actually seems to have been its high-water mark. 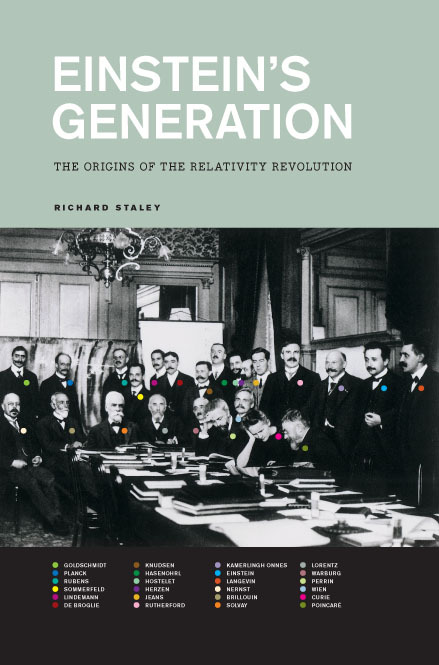 Richard Staley’s 2008 book Einstein’s Generation: The Origins of the Relativity Revolution is an exemplary work of progressive historiographical craftsmanship, and is very high on my personal list of best history of science books written this past decade. The book is an unabashed work of scholarship, using past historiography constructively to pose and answer a startling variety of questions that both deepen current professional understanding of certain events, and expand that understanding into largely unexplored territories. It is demanding, and will most reward those with at least some understanding of physics and of prior scholarship on both Einstein and the history of late 19th-century physics. Einsteins’ Generation works as scholarship in subtle, but, I think, significant ways that will not necessarily be apparent at first reading, so I want to use this post to try and unpack this book’s argumentative strategies and analyze their power. The first thing I want to note is that the book doesn’t follow a “sandwich” strategy: asserting a central argument in the introduction and conclusion, and then offering a series of cases, or a long narrative, that bolsters that argument. OK, I fess up, I’m pulling out my reserve tank of things I can write about if I haven’t given sufficient thought to the weekly Hump-Day History post. Having been a teaching assistant in a course called the “Einsteinian Revolution”, I think I can rattle off a quick 900-1,000 words on the guy! There is, of course, a historiographical industry surrounding Einstein. Legions of science history enthusiasts are well-aware of his personal biography, his scientific work, his role as a scientific diplomat, his political advocacy. There’s nothing that I can write here that would be considered remotely new or exciting, so this one goes out to all those who haven’t yet joined the thousands of Einstein groupies out there, those who know him mostly as an icon. (Certified groupies may feel free to cluck their tongues at the insufficient characterizations offered here). Let’s focus on the significance and genius of Albert Einstein. As he himself often pointed out, as a day-to-day physicist, he was comparable in talent to the best minds of the theoretical physics community of his day. Where Einstein needs to be considered the best mind of his era is in his ability to conceptualize the fundamental questions at the heart of physical inquiry. Conceptually, there were only a few other physicists in his time who could even really be considered in his league.